G1_Flex Back Cover office Notebook in two Colors. Black or Navy Blue Flex Back cover office Notebook. With crease in the back cover to enable easy page turning. Includes elastic closure, ribbon page marker and 80 sheets (80gsm) of lined paper. Black or Navy Blue color. Individual paper sleeve. 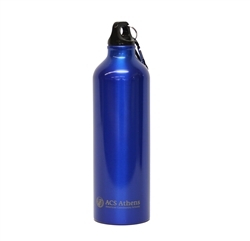 Thermos Metal Mug with ACS Lancers Logo. Heavy duty Back pack with ACS Athens logo (with owl) in the center. Black / Black color. Made by POLO. Back pack made of durable fabric (with water proof cover); has two main compartments, mesh side pockets and elastic cord for equipment restraint. Heavy duty Back pack with ACS Athens logo (with owl) in the center. Blue-Green / Black color. Made by POLO. Navy Blue " Sailor " Bag with golden ACS Athens Logo in the Front bottom Zipped Pocket. Drawstring closure, side handle and adjustable shoulder strap. 600D polyester. 50*30. Duffel Bag with gold printed ACS Athens Logo. Made from durable polyester and offers a large main compartment, making this an idea travel or gym bag. Front pocket with Velcro for additional storage. Adjustable shoulder strap. Clip for Notes / Photos Marble Coaster with ACS Athens Navy print with Owl.